Description: Packet includes: a description of different parts of speech, including nouns, pronouns, verbs, adjectives, adverbs, articles, conjunctions, and prepositions. 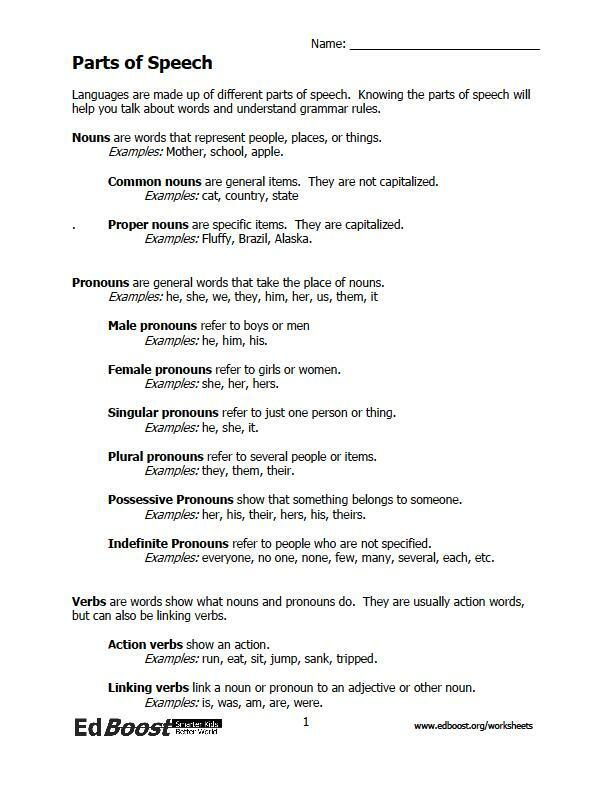 This packet explains the different types of speech and asks students to read a passage and identify the parts of speech through the passage. The exercises also highlight different types of parts of speech, for example, singular versus plural pronouns and adverbs that describe verbs versus adverbs that describe adjectives and other adverbs. Nouns: people, places, and things. There are over 40 nouns in this passage. Circle 40 of them (some will repeat). These worksheets cover a wide range of parts of speech. The passage is best suited for students reading at a 3rd grade level or above. The exercises are also best suited for students in grades 3-8. The first page of each packet is available for viewing by clicking on the image on the right.